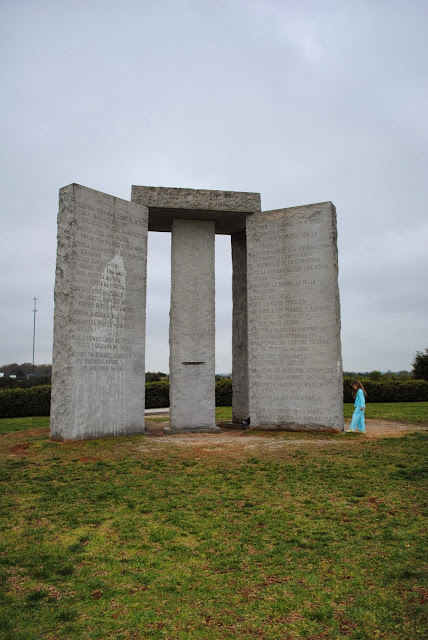 Standing in the sleepy little town of Elberton, GA is easily the most mysterious structure in all of America: The Georgia Guidestones. Nicknamed "America's Stonehenge" the Guidestones are a conspiracy theorist's dream come true. So, what are the Georgia Guidestones? That's a little hard to explain. The Guidestones consist of 5 enormous granite slabs holding up a 6th slab. 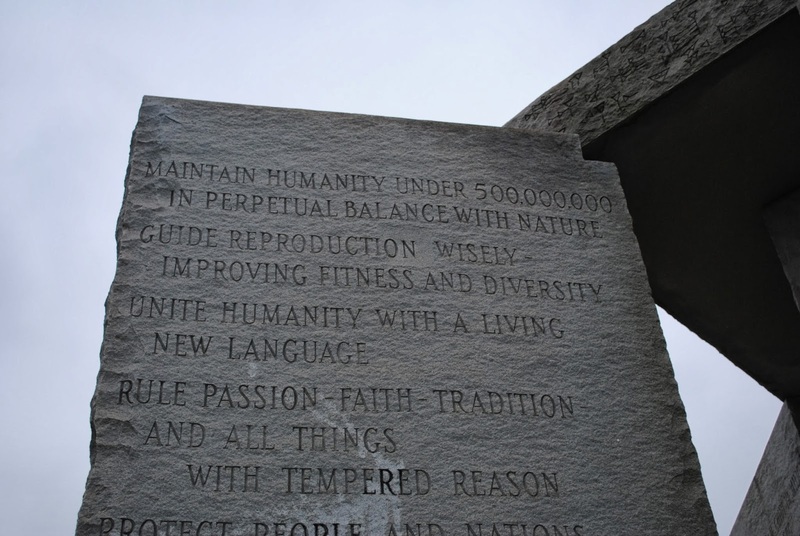 Each slab has the same message on it: A list of rules to "guide humanity". Each side is printed in a separate language: English, Spanish, Swahili, Hindi, Hebrew, Arabic, Chinese and Russian. In addition to this the guidestones are articulated to be a clock, a compass and a calendar as shown in this diagram. Now, the first question any normal person would ask is "Who made that thing?" Surprisingly, we actually know the answer to this. It was constructed by a local stone mason named Joe Fendley. However, despite overseeing the entire construction, Fendley allegedly had no idea the meaning or purpose behind the Guidestones. Fendley was a mason in the granite capital of the world Elberton, GA who had previously worked on smaller local monuments. Fendley stated that he was approached by a mysterious man named R.C. Christian who gave him the blueprints and payed in full to have the monument erected. Mr. Christian openly admitted that he was using an alias and allegedly only shared his true identity with a local banker, who to this day refuses to divulge it. Fendley happily accepted the huge pile of money and erected the Guidestones. The land was turned over to the county, who maintains it as a park to this day. So, what is the meaning behind this thing? Many assume that the Guidestones are essentially an instruction manual for the up coming apocalypse. Others see it as something much more sinister: a satanic 10 commandments. However, if that's true, the devil has sure gone soft. Many have interpreted the rules as a call for a one world government, which has alarmed some Christian groups. The talk of one language and one government are seen as some as a call for the apocalypse. 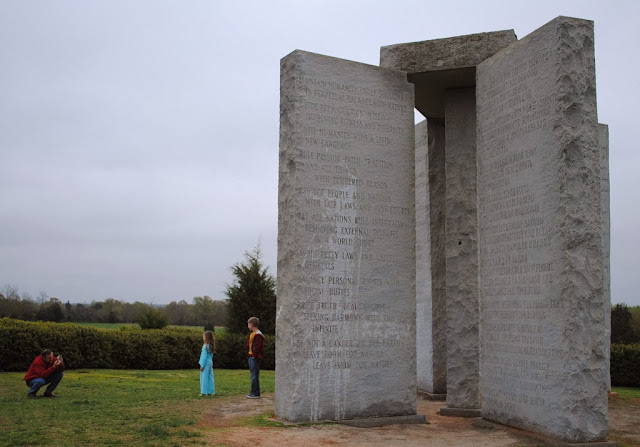 There have been calls to demolish the monument, but the small town of Elberton is unwilling to lose the Guidestones, which are essentially the only tourist attraction they have. 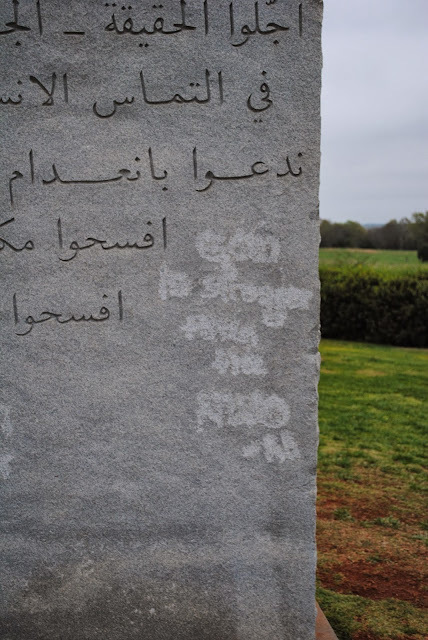 In 2008, some Guidestone haters took it upon themselves and desecrated the stones with graffiti. They also splashed polyurethane paint on the stones, which is very difficult to remove, and some still remained when I visited. As well as remnants of graffiti. 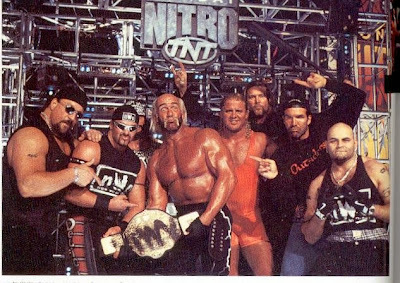 That says "God is stronger than the NWO". 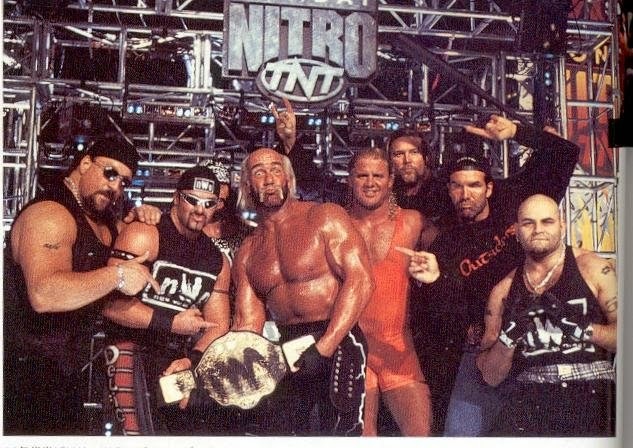 Which I am assume is referring to the Illuminati, not the professional wrestling bad guys. Easily, the most troubling part of the Guidestones is rule number one, which states "Maintain humanity under 500,000,000 in perpetual balance with nature". Now, the current estimated population of the world is over 7 Billion, this makes one wonder what exactly Mr. Christian plans on doing with the remaining 6 1/2 billion people. R.C. Christian did pop up again when a book was released under his name in 1986 called "Common Sense Renewed". It can be purchased on Amazon for the low low price of $424.95. The book is scary stuff and essentially talks about using Eugenics to better society and having the government step in and decided who can and can't breed. 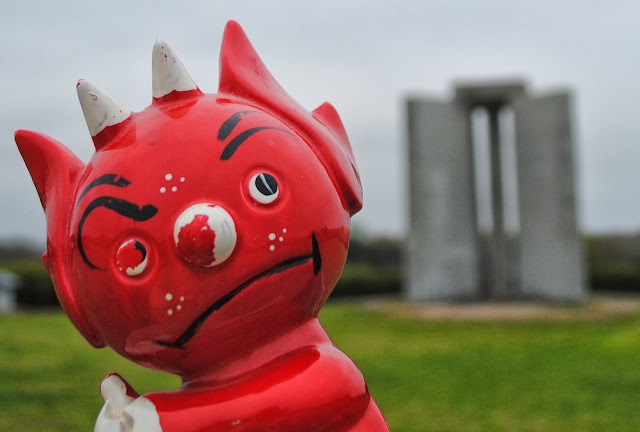 Its pretty scary stuff, although many doubt that it was actually written by the creator of the Guidestones and that was an attempt to cash in on the Guidestone phenomenon. So who is R.C. Christian? Some feel that R.C. Christian is none other then Joe Fendley himself and that he made up the R.C. Christain Story. The whole mysterious structure was a mere publicity stunt to spark interest in the area and the granite industry. What makes conspiracy theorists salivate is the fact that Joe Fendley was not only a mason in trade, but also a Free Mason, as was the majority of his construction crew. 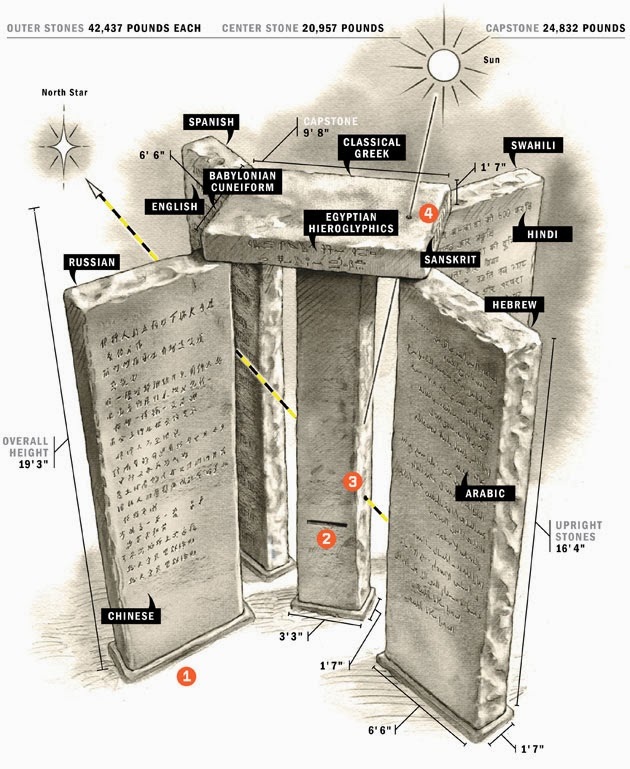 So are the Guidestones a plot constructed by world's favorite secret society? Crazy Southern Billionaire Ted Turner! 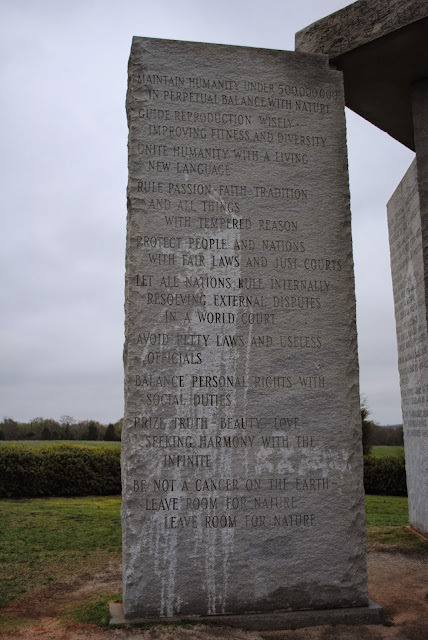 After all, the Guidestones are only a 100 miles away from Turner's home base of Atlanta, GA. Turner has made statements in interviews that seem to jive with the Guidestone's message. He has stated that the optimal population density is between 250-300 thousand people. He is a strong proponent of a strong world government and donates large amounts of money to the United Nations. He is very much an environmentalist and fostered the creation of the "Captain Planet" cartoon. He has talked about an apocalypse caused by over population coming very soon. No one can question that he would have the money to fund the Guidestones. 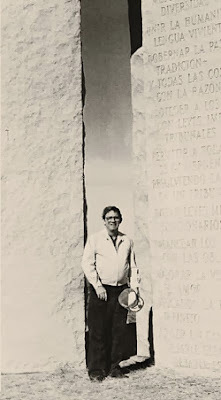 We will probably never know who Mr. Christian really is, but until the end of the world, we can all travel to the Guidestones and use it as a photo op for our children.